Whether you have enjoyed a peaceful early morning down by the river or a bracing journey out of the harbour as part of a fishing party, hopefully the good news is that you will be carrying back something special for the pan or the pot. Strangely, some fishermen don’t appear to be interested in eating their adversary. For them, fishing is very much a sport, a test of nerve and guile between themselves and their quarry. Very often, they will take the fish off their hook and return it to the water so it can live to fight another day. But there is something very satisfying about netting an evening meal, offering a rare glimpse of bygone days when produce didn’t arrive home in a sealed supermarket packet complete with sell-by-date. Preparing a fish is merely a case of removing the scales with the back of a knife, gutting and filleting. It all sounds rather intimidating for the uninitiated but it is an operation easily achieved courtesy of a sharp filleting knife and a little patience in removing the pin bones. Once the head, tails, and fin have been removed, wash each fillet thoroughly under cold running water and you are ready to begin. Now you have to decide on your cooking method. Haddock or cod like nothing better than a hot pan, a few minutes skin side down and then a final minute flipped over and the flesh bathed in the warm addition of some butter. Firmer fleshed fish such as swordfish and tuna are also best dealt with in the skillet, or frying pan, but be sure not to overcook them as they become dry and lose the majority of their flavour. 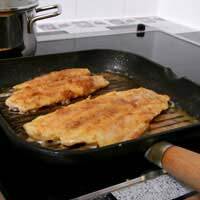 A stress-free method is to cook in the oven, the flesh of the fish encased in parchment paper. Known as en papillote, this is a great way to handle, for example, sea bass and trout. Simply place the fillet in the paper envelope together with some olive oil, lemon juice and a selection of whatever you fancy, such as tomatoes, sliced fennel bulb, or quartered new potatoes. You can easily introduce a little more spiciness via grated ginger, sliced bird’s eye chilli and some crushed garlic. Then simply bake in the oven for 10 to 12 minutes for a moist and delicious supper than can be transferred directly onto the serving plate by simply slitting open the bag.The same combination of ginger, chilli and garlic works well in a poaching liquid of coconut milk, the pieces of fish flesh cubed. Add a little Thai fish sauce, some shredded pak choi cabbage and serve on a bed of steamed rice. Such is the versatility of fish that whatever cooking method you employ: poaching, frying, grilling, steaming, or baking in the oven, there will be a species that benefits from the method in terms of taste and texture. As well as experimenting with different combinations of vegetables, supplement aromatics such as garlic and ginger with different herbs and spices. Both parsley and tarragon are high on the list of fish-loving herbs, along with coriander, rosemary and fennel frond, while from the spice rack, smoked paprika, ground cumin and coriander hit the spot. Fishermen have an empathy with their catch that the ordinary consumer never can experience. Having killed the fish themselves, they realise the value of what they are handling and treat it with the respect it deserves. That’s why if you are ever in search of a perfectly cooked piece of fish, head for the house with a fishing rod leaning against the back door.